In a move that is seen by many industry insiders as beneficial to Air Costa, Vivek Choudhary, a young and dynamic 33 year old has today taken over the reins at the airline, as its Chief Financial officer (CFO) and Chief Commercial Officer (CCO). Vivek has a Bachelor of Technology Degree in Computer Science from Jawaharlal Nehru Technological University, and a Post Graduate Diploma in Management (PGDM) in Finance and marketing, from the Indian Institute of Management, Kozhikode. He started his career as a Business Analyst at GMR Group, where he got his first taste of the aviation sector, in the field of airport infrastructure. He later moved onto PVP Ventures, and quickly climbed the ladder to the post of Vice President, Pioneer Group, and later, Vice President of PVP Ventures. He was also a partner at NITSA VIDAE Advisory Services Pvt. Ltd.: a Business Consulting firm focused on Market research, Project Feasibility Studies, Valuation Studies and the whole cycle of Fund raising. His involvement in these fields makes him ideally suited to understand the very subjects that airlines both revolve around, and are plagued with, especially in a country that is hostile to this sector. In April 2010, Vivek joined LEPL Projects Limited as Vice President – Corporate Finance. Vivek was instrumental in the setup, and planning of Air Costa, from the days when it was just an idea, and has lived through the red-tapism, bureaucracy and frustration that any startup airline will go through, more so when it is not an offshoot of an already established airline brand. He and his team studied the airline market and made strong attempts to avoid the mistakes of other airlines. Yet, the regional nature of the airline throws open a different battlefield, where the rules of the game may have to be twisted, in part: a challenge when an airline is the first of its kind in recent years, and inexperienced. The new role allows him to focus entirely on the airline business, rather than sharing focus with other projects and ventures taken up by the LEPL group. Recently, 22 flights, accounting for 55% of daily flights at the airline, were cancelled due to issues with planning. 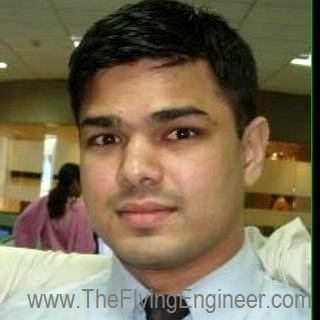 The Flying Engineer had an opportunity to interact with Mr. Vivek, and was pleasantly surprised to find a financial officer very well versed with the technical terms, jargon, and nuances in the world of aviation. Vivek is beyond financial: he has a keen eye and an unquenchable thirst for the technical aspects of aviation. He is weak on show and strong on performance. These perceived qualities make Vivek the ideal candidate for the role of the Chief Officer-Financial and Commercial. He will be guided and assisted by a few former Finnair executives. In the words of the director-regional business development of a leading aircraft manufacturer, “We need more Viveks in this country. He understands the subject. He’s willing to learn. He sees what others miss. And that can make all the difference”. We wish the soft spoken, humble, and attention-shy young gentleman all the very best in steering India’s youngest airline towards profitable routes and smooth operations.